Timeline of Alabama/America through 1840, prior to which time Native-Americans were in Elmore Co. and Alabama in significant numbers. Adapted from the excellent version on the website of the Alabama Department Of Archives & History. Outline of Prehistory and History in the Southeastern U.S. from the National Park Service provides a broad perspective of the prehistory and history of the Southeastern U.S. References to Horseshoe Bend Nat.Mil. Park may be considered to apply specifically to Elmore Co. and adjacent area. Moundville in Hale Co. 1000-1500 a.d. This could have been the same culture which produced the Taskigi Mound in Elmore Co.. Ancient Architects of Mississippi describes what may have been a similar culture to that building Elmore Co.'s Taskigi Mound. in North Georgia Mississippian culture 800 a.d. from the N. Georgia Native Americans site. Article providing the perspective that the Creek and Cherokee were but the remnants of large diverse Indian groups present before the appearance of Europeans. Loaded with links worth following. DeSoto's route, 1540 through presentday Alabama. 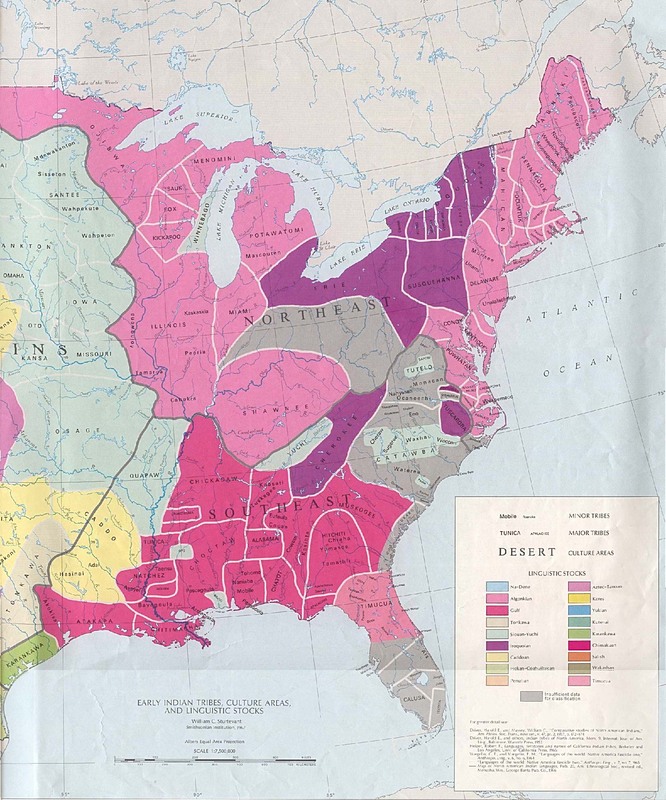 A feature of UT Library Online Early Indian Language Areas of Eastern U.S.
[617K]shows Elmore Co. to lie within area designated as "Alabama", and south of area designated "Tuskegee". From "Maps on North America before Colonization"
Alibamu-Koasati migrations beginning in the early 1700s from present-day Alabama into present-day Mississippi, Louisiana and Texas, with emphasis on pottery. 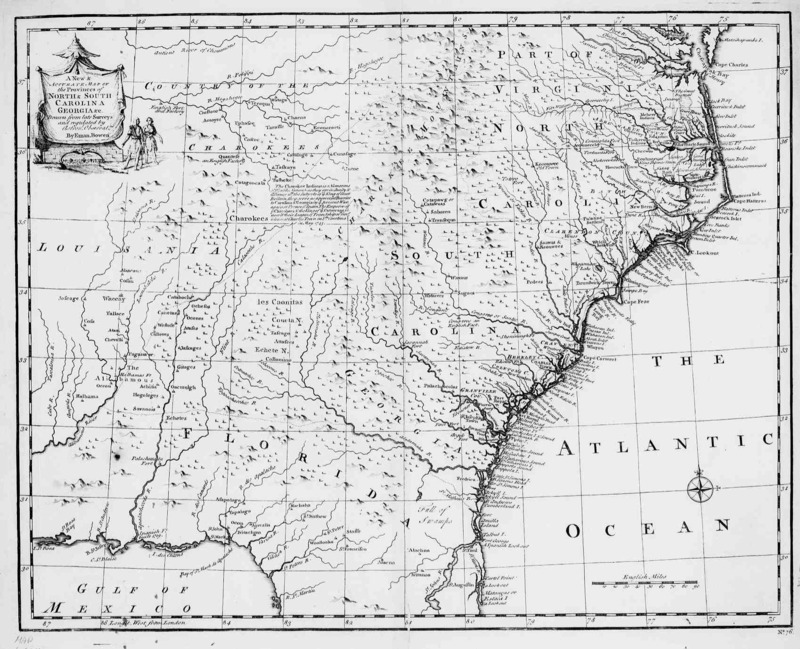 1747 Map of NC, SC and GA [255k] by Emanuel Bowen. The area of present-day Elmore County AL may be seen at 86 W. and 33N (at the left edge of the map. The course of the Tallapoosa River (named Loenahatche?) is much distorted from modern maps, making the modern Tallassee area appear almost due north of that for Wetumpka. "Tallacee" and "Halbamas Ft.(Fort Toulouse) are visible. 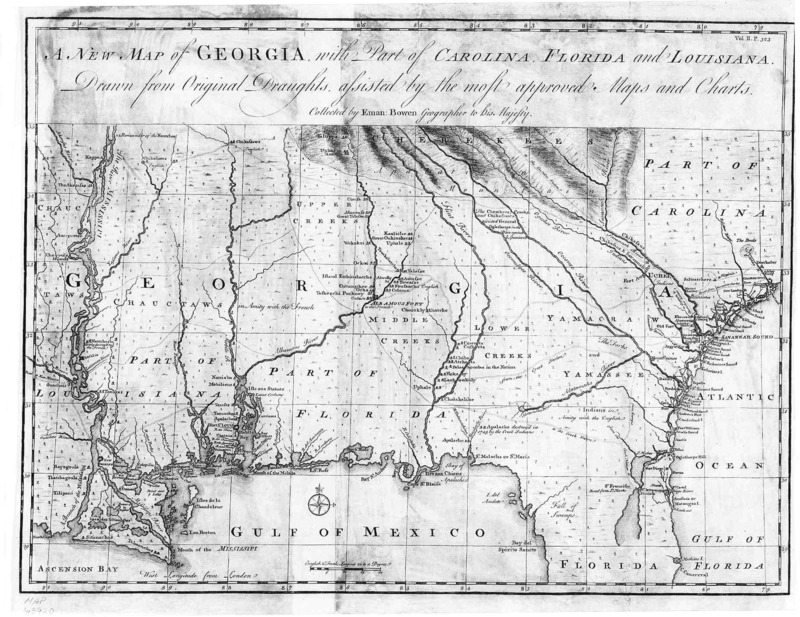 1748 Map of GA [323k] by Emanuel Bowen. The area of present-day Elmore County AL may be seen at 86 W. and 33N (near the center of the map between the "R" and "G" of the name "Georgia"). The Tallapoosa (un-named) has the usual distortion from modern maps, Albamous Fort (Toulouse),Talassee and phonetic equivalents of Wetumpka, Tuckabachee and Kowaliga are seen.
. Long but informative articles by Eric Miller about the Creek Indians of GA and AL as affected by the conflicting approaches of the U.S. and Georgia governments. Yazoo land grant map [84k] from around 1797. The Tallapoosa River was named the Oakfuskee River. The western third of present-day Elmore Co. was in the area for "The Georgia Company". Map of United States about 1800 [602k] linked from Bodleian Library, Oxford. Slow loading. The Tallapoosa River shows yet another name (Loasehatche?). Coosa River shows current name. Separate areas are shown for Creeks and Muscogees.